After a bit of cutthroat competition involving a waitlist and a rush to a sign-up event to snag one of fifteen spots off said waitlist (oh New York, why must everything be so difficult? ), I managed to secure a spot in a local CSA for the season. One of my favorite things about being in a CSA is also its big challenge…having to think quickly so that the surprise assortment of perishables you are presented with doesn’t do just that. I am determined not to toss anything into the bin, so I have to get a little creative sometimes. There have been some interesting slaws (a kohlrabi one, in particular, was a stand-out) and a lot of grain and veggie salads. Pickling is another great way to use vegetables, especially because the ten minutes you spend to prep your pickles gives you snacks that last for weeks. They are the gift that keeps on giving, so to speak. When I came home from my CSA pick-up a couple of weeks ago with a sack of Kirby cucumbers, I knew immediately that I wanted to make bread and butter pickles. For just a couple of bucks, I knew I could make sandwich pickles just as tasty as those $10 jars of Brooklyn hipster-made ones that all the gourmet shops around here sell. Quick, refrigerator-style pickles are my thing. I’m just making a jar at a time anyway, so there’s no need for me to get into canning for really-long-term storage. These are extremely easy to make. Not only do you get zingy, crunchy pickled cukes, but also onions(! ), which are equally tasty on sandwiches. The recipe says you can keep them for two weeks, but I’m betting that in their vinegary brine, they’ll keep for up to a month in the fridge. Steph’s Note: The original recipe calls for 3/4 cup sugar, but I reduced it to 1/2 cup (after my experience making some too-sweet pickles out of another veggie a few weeks ago). Use the amount you think would suit your tastes. -Toss cucumbers, onion, and salt in colander set over bowl. Let stand 1 hour. Discard any liquid collected in the bowl. -Bring vinegar, sugar, mustard seeds, celery seeds, corriander seeds and turmeric to boil in large saucepan. Reduce heat to low, add cucumbers and onion, and press to submerge in liquid. Cover and cook until cucumbers turn dullish olive-brown, about 5 minutes. -Transfer entire pan contents to glass bowl. Refrigerate, uncovered, at least 2 hours before serving. Pickles can be refrigerated in a clean jar or covered container for 2 weeks. Oh, yeah!!! You thought I wouldn’t notice this, didn’t you? 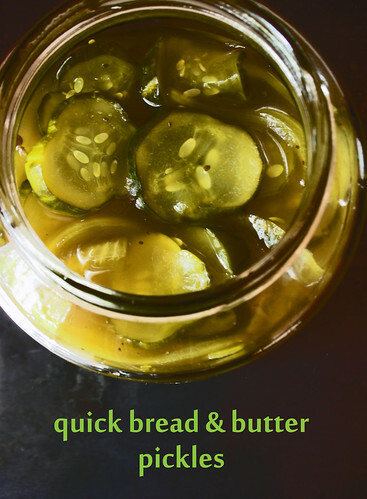 I am the pickle queen…love pickles and am thrilled to see this recipe. Thanks…am going to get my kirby cucs asap and can’t wait to try this one. Thanks. Steph, I’m making these later today and am hoping you are around to answer this question: How big is a “large” jar? Quart size? Thanks! Looking forward to these! Thanks! I was just wondering if I was looking at a gallon or a quart of pickles…just how many pickles can I eat anyway…lol! This helps, thanks. I will let you know the result…thanks so much! Hope you are having a great weekend. It’s Pickle Up weekend on Twitter with some friends, we are making pickles…I am doing yours and two others so I can have a variety.